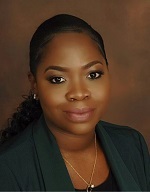 Shari’ received her Bachelor’s degree from Georgia Southern University at Armstrong State University (formerly Armstrong Atlantic State University), her Master’s degree from Mercer University, and her Juris Doctor from Walter F. George School of Law, Mercer University. Shari is also a past Kid’s Chance Scholarship recipient. She is a member of the Georgia State Bar. She has practiced in the areas of family and criminal law, served as a prosecutor for a local municipality, and now defends worker’s compensation cases.